Human beings are clever in many ways, but our attention is easily distracted from the support systems that our lives depend on – food, water, soil, and climate. Paved surfaces, and pervasive media, amplify our tendency to leave living systems out of sight, and out of mind. This prompts a question: Under what circumstances would we connect with, and look after, the living systems we depend on? This is where Annechien Meier’s cultural and aesthetic practice comes in. Meier is among a vanguard of artists to explore real-world interventions that that re-connect us – viscerally, and emotionally – with the living systems we’ve lost touch with. In contrast to policy makers, or activists, who tell us things, artists like Meier focus our attention on the positive qualities and potential of often small-scale, humble, living things that surround us. In her recently established Laboratory of Microclimates Meier, together with film maker Gert-Jan Gerlach, uses a variety of artistic tools – installations, performance, and visual media – to draw peoples’ attention their social and ecological surroundings. The aim of each installation is to excite curiosity about the potential of their micro-context among people who might not otherwise have connected with their place – or with each other. 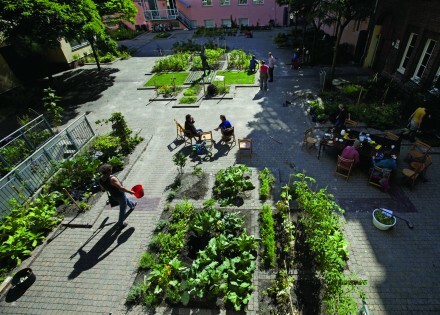 During fifteen years of projects to do with urban agriculture – in gardens, allotments and other food producing sites – Meier has demonstrated that art projects can be highly effective social catalysts. Citizens, who may previously have been socially isolated, and inactive, have often been motivated by her work to participate collaboratively in local processes of food production and exchange. With her Mobile Allotment Garden project, for example, Meier whets a city’s appetite for urban agriculture street corner by street corner. Meier would park her mobile garden temporarily in spaces that were often the opposite of green: a footpath, square, pavement, a motorway. These green ‘hacks’ of public space created physical evidence of how a forlorn corner of a city could come, literally, to life. 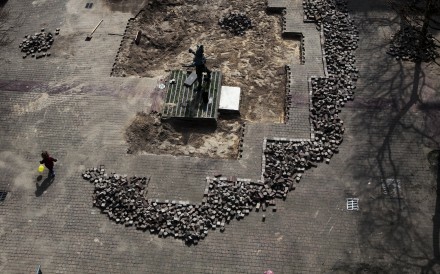 A project at Panderplein (Pander Square) in The Hague, hidden away near the city centre. shows how Meier’s approach works on a larger scale. In what used to be an anonymous, paved and little-used space, Meier ‘s public art project mobilized local people to take an active part in the transformation of this shared local territory. A diverse patchwork of beds was planted with edible flowers and old strains or otherwise forgotten vegetables – including unknown strains such as Portuguese cabbage. These planted beds not only increased biodiversity in this inner-city site – they also transformed the social climate: Local people now linger in the square rather than just walk or bicycle through it. This positive outcome is long-lasting, too: Three years after its inauguration, Panderplein has become an urban agriculture laboratory that is visited by local citizens and curious officials from the city and beyond. 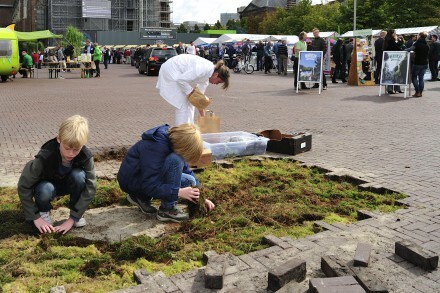 Bringing Panderplein back to life involved the removal of large areas of hard paving – both to make space for the beds, and to allow rainwater to drain directly into the neglected soil. 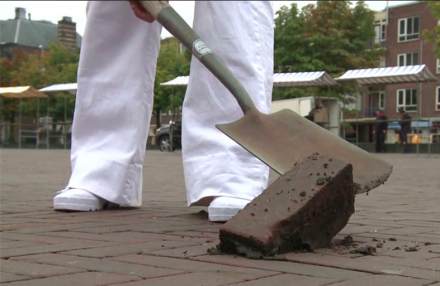 This technical aspect of the Panderplein project stimulated Meier to contact Depave, in Portland, Oregon, where community-led de-paving has become part of the city’s planning process. Meier hopes that The Hague and other cities can be persuaded to embark on schemes of equal ambition. Art projects can stimulate demand for urban farming, but social practices are important if these kinds of urban transformation are to be sustained through time. The design of ways to share, and collaborate, matters just as much as what kinds of plants to put in the beds. Citizen action on its own is just one part of the transformation process. If urban farming to thrive, official support is also needed on such planning issues as land tenure, access to water, health and safety, and security. These tasks are not easy always for a city government to deal with – but cost is a powerful incentive: It costs 200 euros per square metre to build a road, but just 50 euros, including de-paving, to open up the space for an urban farm. Encouraged by the success of these early projects, Meier has now established a Laboratory for Microclimates (LfM) to undertake similar projects on a larger scale and with new partners. A microclimate, or biotope, is a small patch of life in a surrounding landscape which may appear to be monotonous, or even dead; microclimates can be found in hedges, roadside verges, drainage ditches, abandoned buildings, car parks. Meier’s idea is to attract peoples’ attention their social and ecological surroundings; demonstrate that there is more life there, already, than it may appear; and then, based on the potential that has been revealed, to stimulate local production and social interaction in those locations. One of LfM’s first projects involves a fascinating coastline protection project in The Netherlands called Zandmotor (The Sand Motor). 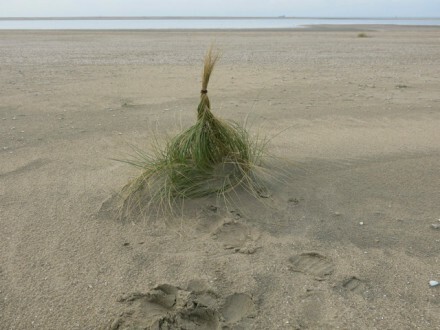 A number of artists, including LfM, have been commissioned to create art installations on Zandmotor as a way to involve the public in discussion about man’s changing relationship with the sea. This discussion is not theoretical new kinds of infrastructure that will be needed to keep Holland above water in an age of climate change – and citizens need to be involved to help make them work..
For the last fifty years, The Netherlands has relied on a vast network of concrete dykes and dams, called Delta Works, to protect this man-made country from the sea.These expensive man-made structures have had unforeseen side-effects: They disrupt natural ocean flows on the coast, which increases erosion; and they upset the natural balance between salt and fresh water upon which the health of large coastal ecosystems depend. With Zandmotor, the Dutch authorities are taking a radically different tack. Rather than use brute force and concrete to keep the sea under control, they now treat the sea as a partner in coastal protection. The ‘motor’ is a hook-shaped peninsula, made of sand, that extends one kilometre into the sea and is two kilometres wide where it joins the shore. Although sand-dredging machines have been used to instal the ‘motor’, nature will do the rest of the work for the next 20 years; the sand will be moved by the natural action of waves, wind and currents along the coast. This hybrid man-with-nature infrastructure is more affordable than the Delta Works approach; it will also reduce the disruption to natural sea flows caused by dredging and dike maintenance. Although Zandmotor’s government developers describe the area as a “new wilderness’ – Meier’s art project will question the implication that nature, and the man made world, can ever be truly separate. The tiniest physical changes can change the ways that dunes develop, for example – intended, or otherwise. Meier’s project for Zandmotor will demonstrate this. In Portugal, she points out, small but artfully-placed fences have been shown to help young dunes to develop quickly. The sensitive introduction of pioneer plants is another small but important way that human action can shape the evolution of such a ‘wilderness’. 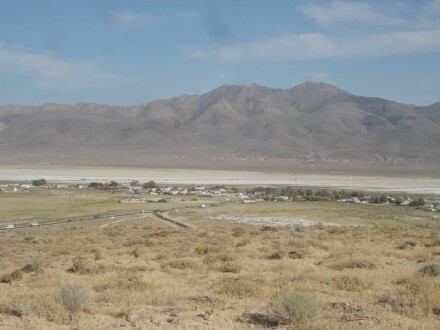 In another sandy environment – the Black Rock desert, in the United States – Laboratory for Microclimates is working on another small installation within a larger agenda. Meier’s partner in LfM, Gert-Jan Gerlach, is working in a small desert town that gears his name – Gerlach, Nevada.The project is to capture rain and dew so that the community garden and greenhouse of a local school may be re-hydrated by natural means. The water collection system consists of recycled PET bottles, grouped in a circle around a native desert plant; LfM calls their installation the ‘Desert Flower’. When parks were built in past centuries they were promoted as the “green lungs” of towns. and cities. Today, the greening of cities is less about big green spaces and more about patchworks, mosaics, and archipelagos of small but numerous projects. The potential number of micro-climatic sites for such grassroots projects is huge. There are parks, cemeteries, watercourses, avenues, gardens, and yards to adapt. There are roadside verges, green roofs and facades to plant. Sports fields, vacant lots, abandoned sites and landfills can be repurposed. There are large and growing numbers abandoned buildings and ruins, empty malls, and disused airports with the potential to be re-imagined as living sites. 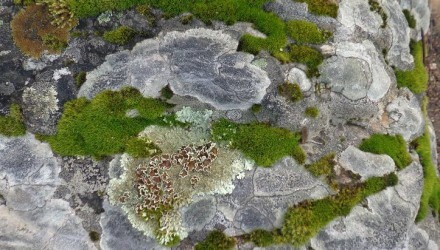 As connections between these micro-sites are made by blue-green corridors of different kinds – from urban rivers, to pollinator pathways – the city’s overall metabolism begins to be transformed. This mosaic concept is one reason why projects like Laboratory for Microclimates are significant within the larger narrative of urban transformation. LfM’s public art actions are not just to be looked at, but act as catalysts for social innovation on a broader urban canvas. They are also important for their attention to the social dimension: when new ways of knowing are introduced by artists, they enable people to act differently, too. In this sense, LfM Is as much about green infrastructure, as it is about art. Whether the policy agenda concerns food security, biodiversity, soil restoration, or public health, artists are now as important actors in the renewal of cities as are engineers and economists. (The writer thanks Stroom for their financial support in the development of this story).